Premium quality, individually-handled, consistent with MS-67 FBL (Full Bell Lines) grade. 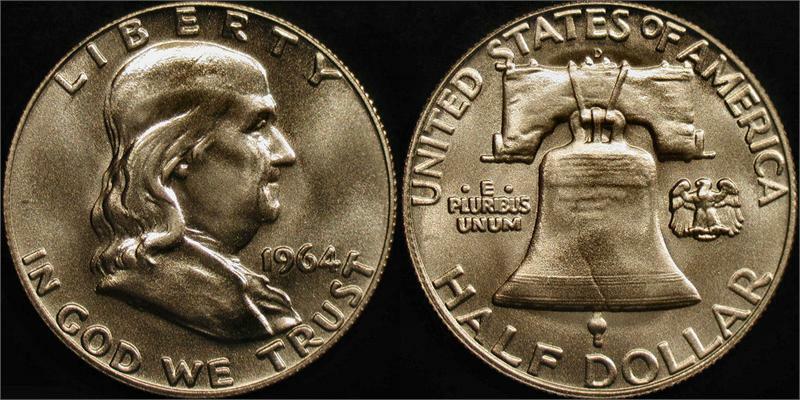 The 1964 Franklin silver half dollar is a coin that almost was. 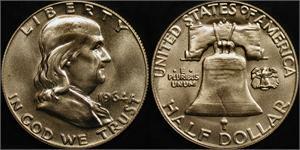 The US Mint performed preliminary preparations to mint 1964 Franklin half dollars. But due to the assassination of President Kennedy, no 1964-dated Franklin coins were actually minted (1964 Kennedy half dollars were produced instead). This coin is absolutely beautiful to look at. Thanks for making these fantasy issues. I cannot praise the quality of your work enough. Keep it up! Another great coin from Daniel Carr. I put in an extra spot in the Dansco album. What a fun coin to have in my BU set and it looks good there. Fits in Your Dansco Album Great !!! Great item ! Fits right in my Dansco, beside the 1963-D. I'm gonna find a way to get it labeled. Thanks Daniel. I had wished you could read the "Pass and Stow" on the bell. I Love It !